Get your Dell printer up and running easily using the Dell Printer Easy Installer and allow flexible connectivity with Ethernet and USB connectivity options. Scan or copy up to 35 sheets hands-free with the ADF and reduce paper use up to 50% using automatic two-sided printing. Help simplify record keeping by copying both sides of an ID card on a single side of paper using the -ID Copy- button. Print more with less interruptions using the optional high yield toner cartridge that prints up to 2,600 pages 2 for greater savings. Minimize maintenance with the single fuser unit designed to last the life of the printer, and a cassette input paper tray that keeps paper dust-free. solution with an intuitive interface that integrates printer essentials and cloud connectivity for easy document management and control of your printer. Character Recognition to convert scans into editable, searchable files. Receive automatic alerts when firmware and software updates are available, or when the toner runs low. Conveniently re-order toner via Dell Printer Hub. recycled, renewable content and chlorine-free paper. Hardware Warranty 7, and enjoy 1-year Advanced Exchange 6 after Remote Diagnosis Service 8. Stay covered longer when you choose optional 2-, 3-, 4-, or 5-year extended Limited Hardware Warranty 9. Get dedicated support 24/7 with Dell ProSupport - 10 service options. Boost office productivity with an easy-to-use 4-in-1 multifunction printer with essential productivity features for everyday printing tasks. - - Easily print, scan, fax and copy with features such as the automatic document feeder (ADF) and built-in duplexer for automatic two-sided printing. - - Get connected easily using the Dell Printer Easy Installer. 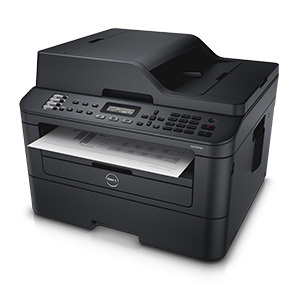 - - Simplify printing tasks and maintenance with the Dell Printer Hub 1. 1. Supports Windows 7, 8 and later only. 2. Toner yield based on testing in accordance with ISO/IEC 19752. Yields vary with usage and environmental conditions. 3. AirPrint-enabled printers work with iPad, iPhone (3GS or later), and iPod touch (3rd generation or later) running iOS 4.2 or later. 4. The printer and the mobile device must be connected on the same network. 5. For details on energy efficiency of ENERGY STAR qualified products, refer to: www.energystar.gov. 6. Meets the requirements of the EU RoHS Directive 2011/65/EU on the Restriction of the use of certain Hazardous Substances (RoHS). 7. For copy of Ltd Hardware Warranty, write Dell USA LP, Attn: Warranties, One Dell Way, Round Rock, TX 78682 or see www.dell.com/warranty. 8. Replacement system or replacement part will be dispatched, if necessary, following phone-based troubleshooting, in advance of receipt of returned defective part or system. Replacements may be refurbished. Defective unit must be returned. Availability varies. Other conditions apply. 9. Remote Diagnosis is determination by online/phone technician of cause of issue; may involve customer access to inside of unit and multiple or extended sessions. If issue is covered by Limited Hardware Warranty and not resolved remotely, technician and/or part will be dispatched, usually within 1 business day following completion of Remote Diagnosis. Availability varies. Other conditions apply. 10. Availability and terms of Dell Services vary by region. For more information, visit Dell.com/servicecontracts/global. 11. Actual print speed may vary with use. Measured in accordance with ISO/IEC 24734 methodology. 12. Duty cycle is defined as the maximum number of imaged outputs a device could deliver in a month. This metric provides a comparison of robustness in relation to other Dell printers and multifunction printers. 13. Tested in accordance with ISO 7779 and reported in accordance with ISO 9296. Acoustics - Declared noise emission values of computer and business equipment. 2015 Dell Corporation Limited. Dell, the Dell logo and Dell Toner Management System are registered trademarks or trademarks of Dell Inc. Other trademarks and trade names may be used in this document to refer to either the entities claiming the marks and names or their products. Dell disclaims proprietary interest in the marks and names of others. Microsoft, Windows and Windows NT are registered trademarks or trademarks of Microsoft Corporation. Android and Google Cloud Print are registered trademarks of Google Inc. iPad, iPhone, iPod, and iPod touch are trademarks of Apple Inc., registered in the U.S. and other countries. AirPrint and the AirPrint logo are trademarks of Apple Inc. Specifications are subject to change without notice.